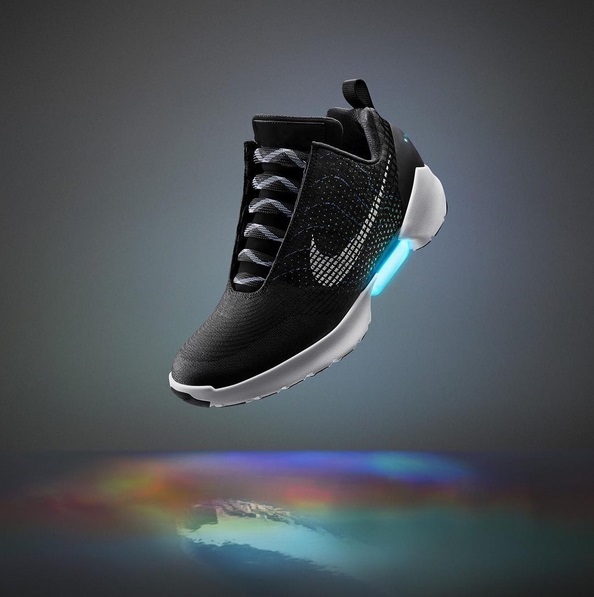 If you’re low-key disappointed that it’s 2016 and we’re still so embarrassingly behind Back to the Future II‘s 2015 version of the world, then rejoice because you can finally buy a pair of Nike’s self-lacing kicks that Marty McFly popularized in the 1989 film. When the initial version of the futuristic shoes were released last year, Michael J. Fox became the first to own a pair, and on November 28th, the new and improved HyperAdapt 1.0 will be available in select Nike stores for anyone else who wants to experience what the future of fashion feels like (read: all of us). As described by Wired, the innovative sneakers of our dreams are designed to “magically adapt to your foot.” Also, prepare to add them to your personal list of things that need charging because these shoes require a bit of juice in order for wearers to engage the self-tying feature. Three hours of charging give you two weeks of insta-lacing privileges and we’ve never been more ready to not lace up our shoes and go. Unfortunately, Nike has yet to release price points for the HyperAdapt, but odds are that such a not-so-minor detail won’t stop Back to the Future fans and general sneakerheads alike from going to extreme lengths to purchase their very own pair. Even if you’re not a tennis shoe type of person, you must admit that the real-life existence of these sneakers is way more impressive than the 21st century’s lame AF version of hoverboards that actually don’t hover at all.